We are just about tired of the same o same o around here – so I thought I’d take the advice from Tricia at Hodgepodge Mom and REALLY check out $5 Dinners. Not say – “Wow, that’s great food you’re cookin there.” but really put it to the test. Today I went through their recipe index and picked out 5 meals – Turkey Balls, Taco Soup, Beef Stroganoff, Santa Fe Chicken and Grilled Chicken Fajita Pasta. I wrote down what I would need from the ingredients then went to the store. In theory, I shouldn’t have spent more than $25.00 – the problem is, they count for the ounces, half pounds, 3 carrots, 1/2 cup of rice as part of the smaller price. One of the things that spurred this on today – is having all of the members of the family peer into an empty pantry, taking dibs on who was going to eat the sugar free apple sauce or red beans for breakfast. I needed encouragement to create a shopping list to fill the pantry – So here goes. 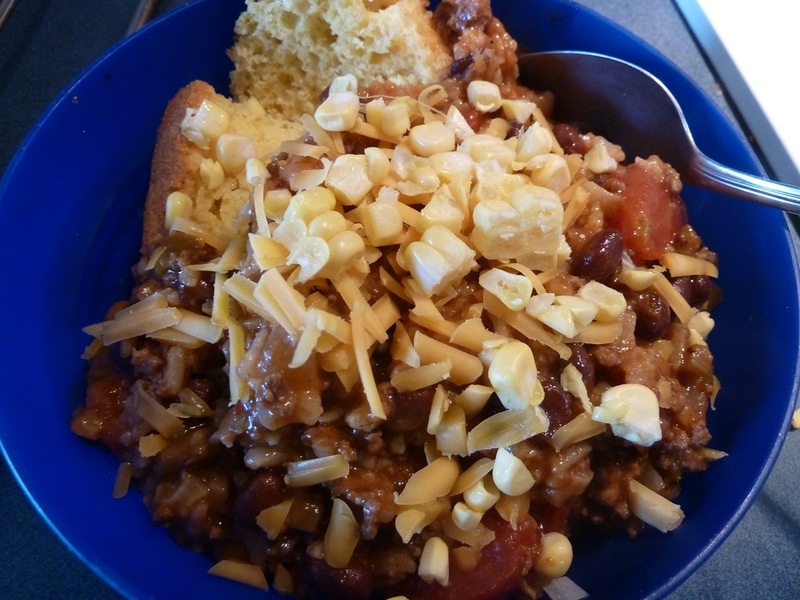 I’ll start with the Taco Soup – which is what we just enjoyed this evening. WHOA! What did I say? I did the grocery shopping this afternoon AND I cooked a great meal? Ya, I don’t know about your house – but 9 times out of ten on our bi-monthly shopping trip it’s take out pizza on the way home. 1/2 Lb Ground Beef (.90) Lean Ground Beef 2.88/lb for 7.34, I split the package into two servings, putting half of it back in the freezer. 1 Taco Seasoning Packet (.33) 1 Taco Pkt from cupboard. Seems like these are at least a dollar. Water Hmmm it’s about 50 bucks a month, not sure what 4 cups is worth. So my cost of what I purchased today – was $7.44. 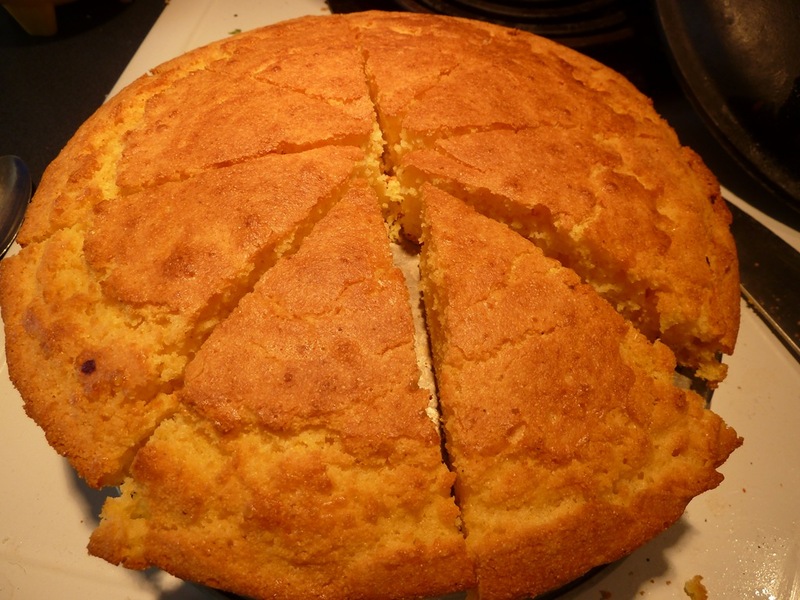 I made an oven corn bread, I have all the ingredients for it – the most would be the 2 small eggs and 1 cup of milk to purchase, and we grated a small amount of cheese on top. So I’d say – with the .99 cent pack of taco seasoning, the rice and water – Oh and I chopped up a sad half of an onion that was in the fridge while browning the meat. Let’s not even count that. . . but it is tasty. so – I’d call it a $10.00 meal – except I think this pot is going to last a couple of days around here! The black Dutch oven is full to capacity. Oh – I added a tablespoon of Knorr Tomato Base and Knorr beef broth to the 4 cups of water that I put the rice in . . .instead of the suggested “another can of tomatoes”. Did ya get that? It is probably a $5.00 meal, since it will definitely feed us twice. 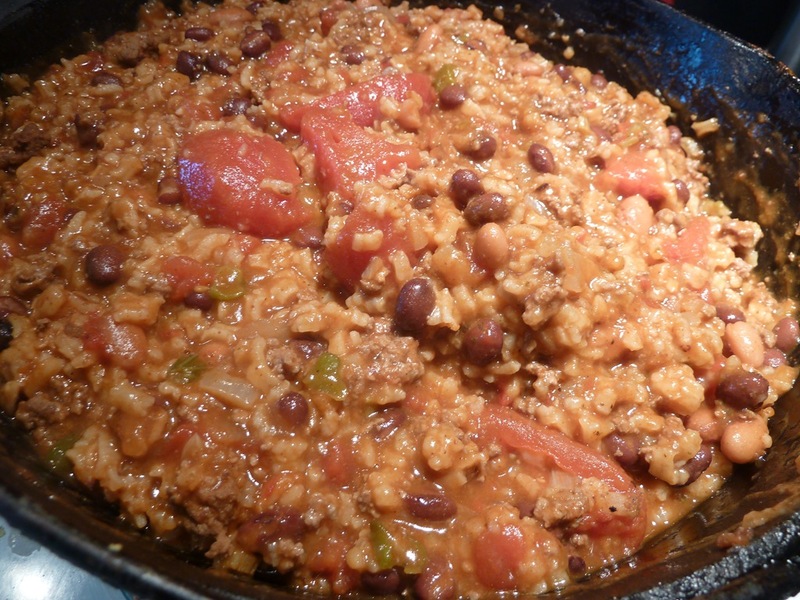 This entry was posted in Some Schooling and tagged $5 dinner, Feeds a Crowd, Taco Soup. Bookmark the permalink. wait…. the watermelon is dessert, right? not IN the soup?? I cut the corn off the cob and put it in a bowl on the side. Youngest son says – No Corn in anything. Crazy Kid. Mmm, sounds like a great recipe. We make a taco soup also. Our’s has meat, a variety of beans, corn, taco seasoning, sour cream, and sprinkled with cheese when in our bowl served with corn chips. I’ll have to try it with the tomatoes and rice. I’m glad I stopped by today to learn about the cheap meals, thanks.